it looks more complete then ever. A great way to start the "TTWII - treasures" segment, which includes some ultra rare, hard to find camera angles, in an amazing new sound. EXCELLENT sound. 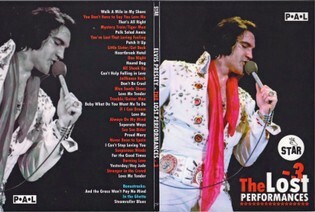 On to the "On Tour Segment" , which has some great new edits on the March Rehearsal as well as excellent live performances; "Live in Texas" includes unreleased performances of "Suspicious Minds" , "For the Good Times" although the footage has some anyoing text in the picture, STAR managed to get that to the background, so it is a better viewing experience. The program ends where it started, and some more cool TTWII rehearsals for you to enjoy! As a special bonus three tracks from the "STAR" release "If I Can Dream" are included. The original release had B/W clips which made it more suitable. Here these clips are presented in full color. Also as a bonus some UNRELEASED footage from "Greensboro" is included, the text here is very annoying, and too bad for the main programm... it does however has "lost performances" of "Love Me Tender" Suspicious Minds" and "For the Good Times" all never released before!